Background and objectives The actuarial risk at 5 years for clinical recurrence of Henoch–Schönlein purpura nephritis (HSPN) and graft loss caused by recurrence of –HSPN after renal transplantation was reported in 1994 to be as high as 35% and 11%, respectively. The aim of this study is to re-evaluate, in a large cohort of patients with a long-term follow-up, whether these rates have changed. Design, setting, participants, & measurements Patients from six transplant centers in Belgium and France with strict diagnostic criteria of HSPN and a potential post transplant follow-up of ≥3 years were included. Results Forty-three patients were included. Patient survival is excellent: 98%, 95%, and 95% at 5, 10, and 15 years, respectively. Overall graft survival rates were 84%, 66%, and 56% at 5, 10, and 15 years, respectively. Clinical recurrence in a first kidney transplant occurred in five patients. Three patients lost their first graft due to HSPN recurrence 19 to 96 months after transplantation, two of whom had systemic signs of the illness. Actuarial risk for clinical recurrence in a first graft is 2.5% and 11.5% at 5 and 10 years, respectively. Actuarial risk for graft loss caused by recurrence in a first graft is 2.5% and 7.5% at 5 and 10 years, respectively. Severity of the disease at presentation and type of immunosuppression after transplantation did not affect recurrence. Conclusions We found that recurrence rates of HSPN after transplantation are lower than previously reported. The actuarial risk of graft loss from recurrence in a first graft is 7.5% at 10 years. Henoch–Schönlein purpura is a systemic vasculitis involving small vessels, affecting mainly children and young adults. It is characterized by the deposition of IgA-containing immune complexes in tissues and classic manifestations of purpura, arthralgias, abdominal pain, and/or renal disease (1). Although its course is generally benign and self-limited in children (1,2), the clinical presentation can be more severe in adults, with an estimated 25% to 30% risk of progression to chronic renal insufficiency (3). For those with ESRD, transplantation is the best option, despite a documented risk of recurrence. The actuarial risk for recurrence of Henoch–Schönlein purpura nephritis (HSPN) and graft loss caused by recurrence were reported in 1994 to be as high as 35% and 11% at 5 years post transplantation, respectively (4). With the advent of new immunosuppressive regimens, an improved early graft survival has been achieved over the past few years (5). As a consequence of an extended graft and patient survival, an increase in the prevalence of recurrence of diverse original nephropathies in the graft (5) and a greater effect on late graft loss (6–8) have been observed. The aim of this multicenter survey was to re-evaluate, in the current immunosuppressive era and in a large cohort of patients with an extended follow-up, the risk of recurrence of HSPN and graft loss caused by recurrence. We also examined potential risk factors associated with clinical recurrence. Adults and children transplanted with a kidney because of HSPN were considered for inclusion in six large European transplant centers (Cliniques Universitaires Saint-Luc, Université Catholique de Louvain, Brussels, Belgium; Hôpital Lapeyronie, Montpellier, France; Hôpital Necker, Assistance Publique Hôpitaux de Paris, Paris, France; Ghent University Hospital, Ghent, Belgium; Hôpital Hotel-Dieu, Nantes, France; and University Hospital Gasthuisberg, Katholieke Universiteit Leuven, Leuven, Belgium). Inclusion criteria were (1) a history of at least two clinical signs of Henoch–Schönlein purpura (purpura and arthralgias or abdominal pain/melena) or a history of at least one of these clinical signs including purpura together with a kidney biopsy characteristic of HSPN (proliferative glomerulonephritis with mesangial deposits of IgA); and (2) a renal transplantation before 2004 to allow a potential post transplant follow-up of ≥3 years. Systemic vasculitis, lupus erythematosus, and cryoglobulinemia were excluded in all patients. Histologic recurrence in the graft was defined as segmental or diffuse granular deposits of IgA in the mesangium and/or along the glomerular capillary walls. Clinical recurrence occurred either as IgA nephropathy (IgAN), defined as histologic recurrence accompanied by microhematuria and proteinuria unaccounted for by rejection, or full-blown HSPN recurrence, defined as IgAN recurrence with extra-renal signs of the illness. In all centers, graft biopsies were performed in the clinical setting of hematuria with or without proteinuria, isolated proteinuria, and/or renal graft dysfunction. Time to ESRD was defined as the time between initial diagnosis of HSPN and initiation of dialysis or pre-emptive transplantation. The results are presented as the means ± SDs or median (25th to 75th percentile) or n and percentage as appropriate. Patient and graft survival rates were calculated according to Kaplan–Meier curves. For survival analysis, patients with graft loss were censored at the time of resumption of dialysis. Univariate analyses were assessed using the Pearson crossproduct correlation coefficient or the Fisher exact test as appropriate for binary variables and the t test or the Mann–Whitney U-test for continuous variables. Statistical analyses were performed using predictive analytic software (SPSS, Chicago, IL) version 18.0 software. All of the tests were two-tailed, and a P value <0.05 was considered to be significant. Ninety-one files of patients with a diagnosis of HSPN were retrospectively analyzed. Forty-five patients were excluded: 36 patients did not meet the requested inclusion criteria, and nine patients had a follow-up less than 3 years. Forty-three patients transplanted between 1968 and 2004 were included (Table 1). They were predominantly men, with a median age at transplant of 29 years (21 to 41 years). Fifty-four who received transplants (43 with cadaver donor and 11 with living donor) were performed (nine patients underwent two transplantations and two patients underwent three). The median time between diagnosis and ESRD was 71 months (36 to 119 months). Thirty-six patients had been on hemodialysis, six had been on peritoneal dialysis, and one had never been dialyzed before transplantation. Median time on dialysis was 22 months (9 to 47 months). Patient survival is excellent: 98% at 5 years and 95% at 10 and 15 years (Figure 1). Two patients died: one of septic shock and one of unknown cause, respectively, 14 and 74 months after transplantation. 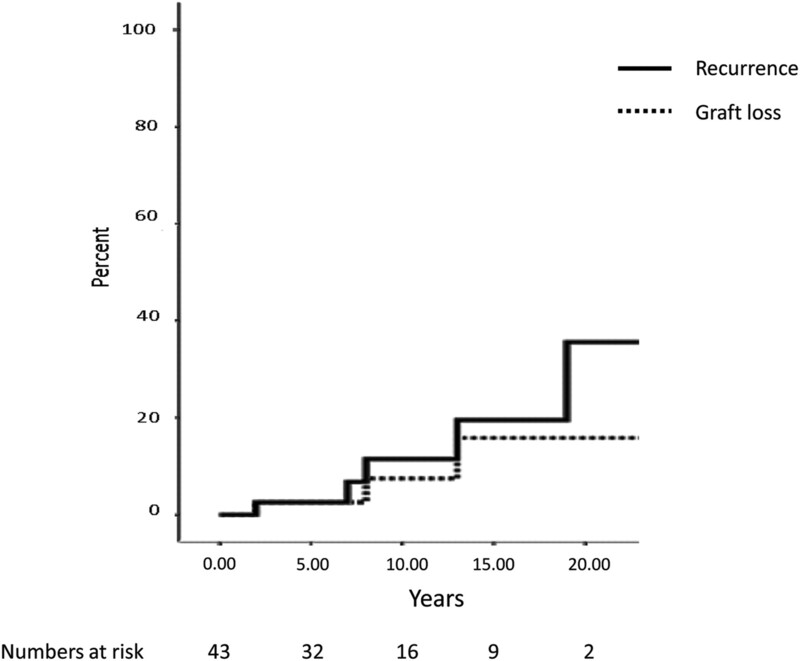 The median post transplant follow-up period of the 54 grafts is 84 months (48 to 156 months). The overall graft survival rates are 84%, 66%, and 56% at 5, 10, and 15 years, respectively, similar to graft survival rates of first grafts (84%, 65%, and 60%) (Figure 1). Twenty grafts were lost for the following reasons: primary nonfunction (n = 1), patient death (n = 2), chronic allograft nephropathy (n = 13), and clinical recurrence (n = 4). Patient survival censored for graft loss at the time of resumption of dialysis in kidney graft recipients transplanted due to Henoch-Schönlein purpura nephritis, and Kaplan–Meier curve of survival rates of a first graft. Isolated histologic recurrence was documented in seven of the 21 grafts in which a kidney sample was available (20 biopsies; one transplantectomy), i.e. a prevalence rate of 33%. Clinical recurrence occurred in five recipients of a first kidney transplant, i.e. a prevalence rate of 12% (three had IgAN recurrence with hematuria and proteinuria, and two had HSPN recurrence with hematuria accompanied by extra-renal signs of the disease). The actuarial risk for clinical recurrence in a first graft was calculated as 2.5% and 11.5% at 5 and 10 years, respectively (Figure 2). Three first transplants were lost due to recurrence (two with HSPN recurrence and one with IgAN recurrence), 19 to 157 months after transplantation. The actuarial risk for graft loss caused by recurrence in a first graft was 2.5% and 7.5% at 5 and 10 years, respectively (Figure 2). Two patients underwent retransplantation: in one of these patients the graft is functioning well at 3 years and the other patient was lost to follow-up. Actuarial risk for clinical recurrence and graft loss caused by recurrence after first kidney transplantation. One recipient of a second graft who had lost his first kidney transplant due to chronic allograft nephropathy presented an HSPN recurrence and lost his graft due to recurrence. His second graft was from his mother. He underwent retransplantation with a third kidney from a deceased donor 4 years later and was lost to follow-up 9 years later with a functioning graft. Clinical recurrence in a first kidney transplant occurred in five patients (Table 2). All were men. Age at the disease onset varied from 2 to 52 years (two children <18 years). The severity of the disease reflected by crescents at initial biopsy and time between the onset of the disease and ESRD did not affect recurrence. Three patients had received a kidney from a living, related donor: one from his father and two from human histocompatibility leukocyte antigen–identical siblings. These latter two patients lost their graft due to HSPN recurrence. Immunosuppressive treatment after renal transplantation was not significantly different between patients who relapsed and patients who did not. Four patients who received transplants between 1982 and 1988 were treated with azathioprine and corticosteroids: three of them had cyclosporine as calcineurin inhibitor (CNI), and one was CNI free. The fifth patient was transplanted in 2001 and was receiving tacrolimus, mycophenolate mofetil, and corticosteroids. In this multicenter analysis, we have retrospectively reviewed the outcomes of 43 patients who underwent renal transplantation for HSPN with a mean follow-up of 105 months. We have found that recurrence rates and the risk of graft loss caused by recurrence are much lower than those we previously reported (4). A total of 54 grafts in 43 patients were reviewed. In 21 cases, graft biopsies with immunofluorescence staining were available. Histologic recurrence was documented in seven grafts, a prevalence rate of 33%. This figure is lower than that previously reported. Indeed, Meulders et al. (4) reviewed a total of 74 grafts placed in 67 patients pooled from 12 studies published between 1972 and 1994 and found a rate of histologic recurrence of 53%. More recently, Moroni et al. (9) reported a histologic recurrence rate of 64% (eight recurrences of a total of 12 biopsies performed in 17 patients). Because biopsies were not performed routinely in either of these studies including ours, the true prevalence of histologic recurrence is difficult to assess and may be underestimated. Furthermore, timing of the biopsy might be important, because histologic recurrence may occur late after transplantation (6,10). Histologic recurrence is not necessarily associated with clinical recurrence translating into hematuria, proteinuria, and/or renal insufficiency. Clinical recurrence occurred in only five patients out of 43, i.e. a prevalence rate of 12%. This is lower than the 29% rate reported by Meulders et al. (4) on the basis of three series including a total of 34 patients and much lower than the 41% prevalence rate recently reported by Moroni et al. (9) in 17 patients. The actuarial risk for clinical recurrence in our multicentric study was as low as 2.5% at 5 years and 11.5% at 10 years. Again, this is much lower than the 35% actuarial risk at 5 years reported by Meulders et al. in 1994 (4), which was on the basis of the course of 23 patients pooled from two series including mainly children. We calculated an actuarial risk for graft loss caused by recurrence as 2.5% at 5 years and 7.5% at 10 years, also lower than the 11% rate at 5 years reported by Meulders et al. (4). Our definitions of recurrence (histologic or clinical) were the same as in the Meulders study, allowing a good comparison between results of the two studies. Of note, 10 patients from the Meulders study and followed at our institution were included in this series. Interestingly, our 10-year rate of graft loss caused by recurrence is very close to the 9.7% rate found in a large cohort of patients IgAN reported by Briganti et al. (7). A variety of risk factors for recurrence of primary glomerulopathies in the renal graft have been suggested. An aggressive form of the original disease with crescents at initial biopsy and a rapid progression to ESRD may predict a higher rate of recurrence (11–13). In our five patients with recurrence, crescents were present in the biopsy of the native kidney in only one patient, whereas the time between diagnosis of HSPN and ESRD was shorter in patients with disease recurrence than in patients without recurrence (4 years [1 to 6 years] versus 6 years [3 to 11 years]) but not reaching statistical significance. Some reports, not confirmed by others (14), have suggested that transplantation from living, related donors (12,13,15,16) was associated with an increased risk of recurrence of IgAN. In contrast with our own previous series (4) and that of Moroni et al. (9), we have found that three out of five recipients of a living, related donor had a recurrence, a proportion that is higher than that observed in those without recurrence (Table 2). It is also of interest to note that both patients who had full-blown HSPN recurrence received their transplants from a living human histocompatibility leukocyte antigen–identical donor and lost their graft due to recurrence. In addition, another patient who received a second graft from his mother also lost his graft after a full-blown HSPN recurrence. Although this raises the hypothesis of a familial predisposition to the disease, these observations must be interpreted with caution because of the small number of patients. Whether the type of post transplant immunosuppression influences the risk of glomerulonephritis recurrence remains controversial. In IgAN, mycophenolate mofetil as opposed to azathioprine-based therapy was initially thought to lower the incidence of recurrence; however, this was not confirmed in a small retrospective study (17) and has not been evaluated in a prospective study. Furthermore, a recent study by Mulay et al. (18) showed that the risk of graft loss caused by recurrent glomerulonephritis was not associated with any specific immunosuppressive medication. Indeed, there was no difference between azathioprine and mycophenolate mofetil or between cyclosporine and tacrolimus in the risk of graft failure caused by recurrence (18). In contrast, Berthoux et al. (19) reported a protective role of anti-thymocyte globulins induction therapy in IgAN recurrence. In our population, we did not observe a statistically significant difference in immunosuppressive treatment between patients who relapsed and patients who did not (Table 2). We acknowledge the limitations of this study. It is a retrospective study with a relatively limited number of patients and no systematic biopsies of the graft. However, it is the largest reported cohort with patients from six large West European centers, with a strict diagnostic criteria set of HSPN, a clear-cut definition of recurrence (allowing a comparison with our previous study), and an extended follow-up. In conclusion, we have found that the current recurrence rate of Henoch–Schönlein purpura after transplantation occurring as IgAN or full-blown HSPN is lower than reported before. The actuarial risk for clinical recurrence in a first graft is indeed 11.5% at 10 years, and the actuarial risk for graft loss caused by recurrence in a first graft is only 7.5% at 10 years. In our experience, HSPN recurrence with systemic signs of the illness is uncommon but constantly associated with graft loss. Whether newer immunosuppressive therapies have played a role in lowering the incidence of recurrence with time remains to be determined.